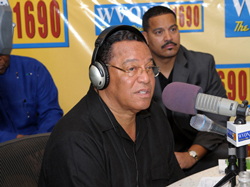 CHICAGO (FinalCall.com) - In his first major national interview since the death of Libyan leader Muammar Gadhafi, the Honorable Minister Louis Farrakhan sat with prominent radio personality Cliff Kelley for an in-studio interview at WVON 1690AM. Minister Farrakhan entered the studio October 25 with a focused and extremely serious look on his face as Mr. Kelley asked him how he was feeling. 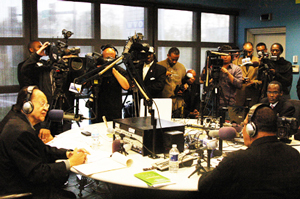 A full media contingent was present for the interview and thousands viewed live via internet webcast as Minister Farrakhan described his close relationship with Col. Gadhafi. The Minister said his relationship began with Col. Gadhafi in the late ‘70s during the time of his work to rebuild the Nation of Islam after the departure of the Honorable Elijah Muhammad. In fact, the relationship between the Nation of Libya and the Nation of Islam goes back even further to 1971 when the Hon. Elijah Muhammad obtained a loan from the Libyan leader to purchase what is now the international headquarters of the Nation of Islam. The Minister described how on September 17, 1985, he experienced something that would forever alter the course of his life, forever linking him and Col. Gadhafi together. While in the small Mexican village called Tepoztlan, Minister Farrakhan described how during the night while sleeping, he was transported to a large mechanical aircraft. Commonly called Unidentified Flying Objects, in the Nation of Islam, these mechanical aircraft are referred to as wheels, or baby planes, and they all emanate from the Mother Plane or Mother Wheel—a human-built planet measuring a half-mile by a half-mile. While there, the Minister heard the voice of his teacher, the Honorable Elijah Muhammad, and received guidance. “I have described this over and over again to those who believe, and of course, those who disbelieve. But a Scroll rolled down with cursive writing on it. And as I began to get closer to it to read it, I heard the voice of the Honorable Elijah Muhammad as hopefully you are hearing my voice right now. He told me that: ‘The president has met with his joint chiefs of staff to plan a war,' and he wanted me to make known the president's plans. And he said, ‘Tell them that you got it from me, Elijah Muhammad, on The Wheel,'” Minister Farrakhan recounted. The Minister said later, while in the West African country of Ghana during a world tour in 1986, it became clear that war was planned against the North African nation of Libya. The Minister sent his family back to the United States and traveled immediately to Tripoli to warn Col. Gadhafi. After doing so, the Minister left Libya to return to the U.S. It took 25 years for current U.S. President Barack H. Obama to fulfill what was started under the president at that time—Ronald W. Reagan. The bombing of Libya in 1986 was considered the most expensive assassination attempt ever, until this most recent assassination attempt, which began in February of this year, he said. Something has been set in motion that will ultimately bring about the end of the United Nations and again, the Minister lamented, “Your joy—I hate to say—your joy will be short lived, for what you have done, America, England, France, Italy, Canada,” he added. The Minister said Pakistan, and North Korea will keep their WMDs and other nations without them will seek to obtain them as the only means of protecting their sovereign nations against the rapacious greed of the warmongering Western powers. “You have earned, now, a Great War that is on the horizon and in killing Muammar Gadhafi, you have upset revolutionaries throughout the world, and American interests are in danger, now, because the spirit that is in the world that loved him will be to do harm to American interests. “That has never happened in these 6,000 years and it certainly is not so in America, and it was not so in Libya. I never lived in Libya, so I don't, like the Libyans, know Libya; but I know something of the good of Muammar Gadhafi that made me to love him as a brother, and to feel a great sense of loss at his assassination,” he said. The Minister then read the reported will written by Col. Gadhafi said to be written less than a week before his death. 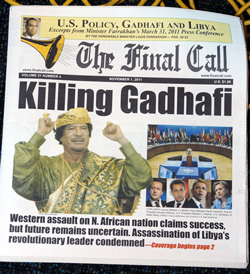 It had been reported that Col. Gadhafi said he would be martyred in Libya, and that he wanted to die where he fought. He then drew attention to the photos of Secretary of State Hillary Clinton, shaking hands with Col. Gadhafi's son Mutassim—Libya's National Security Advisor—approximately a year and a half ago. Mutassim was also reportedly killed on Oct. 20. This shows that an avowed enemy should be watched, and that others in leadership should be watched for signs of betrayal he said as he turned to members of the Nation of Islam inside the studio. The Minister had sharp words for Pres. Obama and Secy. Clinton, as he exposed the backstabbing skullduggery of international leaders. He said the war profiteers will be moving into Libya to rebuild the infrastructure that they were responsible for destroying. Minister Farrakhan and radio host Cliff Kelley discuss America's foreign policy and the aftermath of the assassination of Col. Muammar Gadhafi. He also criticized the Obama administration's use of extrajudicial assassinations using Special Forces and Unmanned Aerial Vehicles, referred to as drones. For example, Osama bin Laden was captured without a weapon, however, he was killed by Special Forces before being brought to trial for the crimes he was allegedly responsible for. Anwar al-Awlaki, an American citizen, was killed in Yemen by a predator drone. A few days later, his 16-year-old son, was also killed by a drone. “Now, Muammar Gadhafi and his sons lie dead! Saddam Hussein and his sons lie dead! Well, what about your sons? They're dying in Iraq on the basis of a lie! They're dying in Afghanistan on the basis of a lie! And now drones are in Pakistan, drones in Somalia, drones in Yemen! When will it stop? America, do you think that you can get away with this?” he asked. 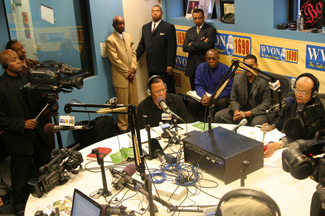 Even during the station breaks for commercials, Minister Farrakhan continued to teach. At one point, he directed his attention to the members of the media contingent present in the studio. He said the corporate media is “bought and paid for” and many who work in media are afraid to tell the truth. Most don't know the truth of Gadhafi's accomplishments, his efforts to unify Africa, his support for revolutionary movements, nor is the unsuspecting public aware of the evil carried out by the American government globally, he said. “This is a hell of a betrayal of the American people when you will not tell them the truth because you're afraid that if you tell the truth, your bosses will take your job from you!” said the Minister. “You don't have a democracy when you don't have a free press! Then pointing to the cameras he said, “You're all slaves—and you love it! So you deserve what you get! The erosion of your democracy! You'll soon be the laughing stock of the world,” adding that soon those involved in the growing Occupy Wall Street movement could soon be targeting the media. “Look how long it took you all to talk about what was going on in New York! It took you two weeks, because the same people that control the banks control the media! You all know it but are afraid to say it! But God put it on Farrakhan to say it for you! And maybe one day you'll get some courage to stand up and give America free media! A real, free fourth estate,” he said. Minister Farrakhan again chided the American government for its continued arrogance citing a recent decision by Pres. Obama to send troops into Uganda, even while announcing complete troop withdrawal in Iraq. He also pointed out that though the U.S.-led NATO operation appears to have been successful from their point of view, the Libyan National Transitional Council leader Mustafa Abdul Jalil announced the nation will be governed under Sharia law, which America claims to be fighting all over the world. Returning to the Occupy Wall Street movement, when asked by a member of the press how he would advise Pres. Obama to keep the protests over the economic crisis here in America from becoming violent, the Minister said the president will “probably instruct the police to be very, very careful,” with the young protesters. “People are hurting and these young people are expressing themselves. At first in New York the police were very hard on them, and this is not the best approach,” said the Minister warning that if the law enforcement officials grow tired of the protesters and any of them are killed, it could take them over the tipping point ushering in a violent escalation. “If it gets to the point where America gets tired of the protest of these young people and something happens—like what happened at Kent State, and young Americans are killed—I tell you, militias in this country that have been training for war against their own government will come out in the streets to protect these children and it's on,” he said. “I told you before that what you saw overseas was coming to your door! And now it is here! And it will get worse! I pray that you will tell your police to be full of restraint. But when they are not, then be careful,” he warned. In a final plea, Minister Farrakhan cautioned Pres. Obama to change his course of action and resist the counsel of his wicked advisors. The Minister has always said how proud he was to see Mr. Obama ascend to the highest political office of the land, however, even before his candidacy was taken seriously, the Minister warned the office of the presidency was fraught with danger and controlled by powerful outside forces. Citing Pres. Obama's decision to surround himself with people from Goldman Sachs who advised him to bail out Wall Street, as well those who were angered by his apologetic overtures towards the Muslim world, it is clear that he is being misguided by those who have another idea for America's direction. They don't want to heal the wounds caused by the injurious policies of previous administrations, and they have no desire to apologize for the evil that has been done. “The moment he did that, a man like (Mitt) Romney (said) ‘We don't need nobody to apologize for us!' Well, if you're wrong, and your policies have injured the nation, somebody has to apologize! If the Pope of Rome was strong enough—and I'm talking about John Paul: When John Paul apologized to the Indigenous peoples of the world that the Church was wrong, how can he apologize and he's the head of all Christendom, and you, this little non-descript former governor of Massachusetts, (are) going to beat the hell out of a president that wants to heal your wounds and bring people together! But you jumped on him! You beat him down! You made him into the man that he's becoming! You should suffer the consequences of it! “And for a man to have won the Nobel Peace Prize after just a few days in office, and now has brought America into five different wars—who led him this way? Who are his advisers?” he asked. The Minister said their desire is to ensure that Mr. Obama will be a one-term president with a ruined reputation.